Manufacturing & Trading of Plastic Bottles & Jars. Yash Plastoprint was founded in 2004 and is engaged in manufacturing and supplying Plastic Bottles & Jars. We offer a long and interesting range of products including Plastic Bottle, Plastic Coolant Bottles, Personal Care Bottles and so on to our revered patrons. We also provide Blow Moulding Services to our valuable clients. They are highly appreciated for being unbreakable, attractive in design, odorless and durable. These bottles and caps are used in pharmaceutical, cosmetic and food industries. We have established a state-of-the-art manufacturing unit for making products in sync with the prevalent market trends. Our quality control unit is loaded with efficient and latest equipment for smooth running of the quality assurance task. We have a spacious warehouse for storing bulk orders systematically, which makes packaging free of hassles and decreases the down time of work. We have a dexterous team of members comprising of administrators, engineers, technicians, quality controllers, transport personnel, sales executives and warehouse personnel. All our professionals work in coordination with each other for the skillful operation of the firm. We operate as a customer oriented organization and offer customized products at industry leading prices. Our committed efforts and rich knowledge base have earned us a huge clientele. Our managing directors, Mr. Sumeet Narayan Gupta and Mr. Satya Narayan Gupta, are the biggest source of inspiration for us. They have nurtured the organization with their immense experience in this domain. Their constant efforts have made the firm set a benchmark in the industry. As a quality centric firm, we ensure our clients that the products offered by us are manufactured in compliance with the set industry standards. In order to manufacture these products, we use excellent quality raw material sourced from the most trusted vendors of the industry. Also, we have advanced manufacturing unit, where we manufacture these products using sophisticated technology as per the variegated requirements of our clients. Furthermore, the procured raw material and finished products are stringently tested by our quality controllers on various parameters in order to ensure their flawlessness. We have a sophisticated infrastructure loaded with high speed machines for making high quality products. Our quality control unit is loaded with innovative technology machines and engaged in following stringent parameters of quality control for meeting with the industrial standards. The warehouse is spacious and divided into various departments for storing different category of bottles and cap conveniently. We have a large transportation network for meeting with delivery of orders, within the stipulated period of time. We are the most remarkable player in the market, producing high quality products in various shapes and sizes. We work as a team towards client satisfaction. The goodwill we have generated is due to the timely delivery products. Plot No. 79, Gali No. 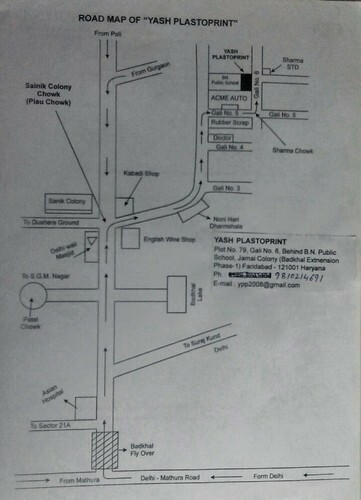 6, Badkhal Extension, Phase- 1, Behind B. N. Public School, Jamai Colony, N. I. T.